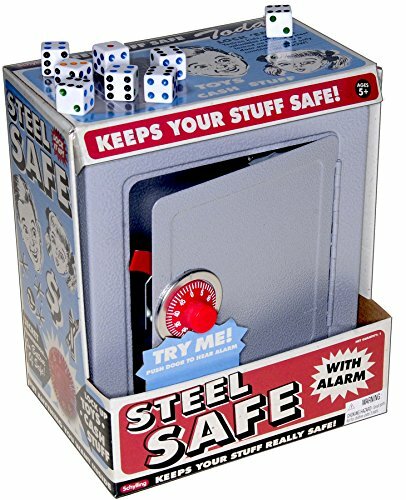 Children will enjoy the ability to keep their small trinkets, coins, money, watches, diary and other valuables in this real steel toy safe. Has a 2 number secret combination. Coin slot on top of safe allows coin deposits without actually opening the safe. But in alarm rings whenever the safe door is opened. (works via a small mechanical spring which automatically winds as door is shut). Safe can double as a savings bank. Help children to develop good savings habits at an early age. Young children love the idea of their own secret storage safe away from prying eyes of others. Bonus of 8 standard size D6 game dice. The perfect trinket to keep in one's safe. White dice with color pips. Has 2 number combination lock, coin slot for deposits without opening safe. Mechanical alarm sounds when door is opened. Measures approximately 8 x 4 x 7.5 inches. Bonus 8 white dice with colored dots game dice. D6, six-sided, game dice. Standard size 5.8 inch. Bundled Items. If you have any questions about this product by Deluxe Games and Puzzles, contact us by completing and submitting the form below. If you are looking for a specif part number, please include it with your message.